^ Sagan 1995, pp. 170-176. ^ Sagan 1995, pp. 178-180. ^ ﻿USAF Accident/Incident Report﻿ (Report). United States Air Force. (1968-01-21). ^ Sagan 1995, pp. 181-182. Blacker, Coit D. & Gloria Duffy (Stanford Arms Control Group) (1984). International arms control. Standford University Press. ISBN 0804712115. http://books.google.com/books?id=WTKrAAAAIAAJ&pg=RA1-PA118. Busch, Nathan E. (2004). No end in sight. University Press of Kentucky. ISBN 0813123232. http://books.google.com/books?id=3iOg-t-3q1sC. Clarke, Lee Ben (2006). Worst Cases. University of Chicago Press. ISBN 0226108597. http://books.google.com/books?id=MYzNtetBpFwC. Croddy, Eric & James J. Wirtz (2005). Weapons of Mass Destruction. ABC-CLIO. ISBN 1851094903. http://books.google.com/books?id=ZzlNgS70OHAC. Greenland during the Cold War. Danish and American security policy 1945–1968. Copenhagen: Danish Institute of International Affairs (DUPI). (1997-01-17). ISBN 8760169222. オリジナルの2009年6月1日時点によるアーカイブ。. http://lccn.loc.gov/97161960. Edwards, Paul & Judy Wajcman (2005). The politics of working life. Oxford University Press. ISBN 0199271909. http://books.google.com/books?id=5Ehn6utOqLwC. Fristrup, Børge (1970) (PDF). Ice Investigations. University of Copenhagen. ISBN 8755000061. オリジナルの2008年12月18日時点によるアーカイブ。. https://web.archive.org/web/20081218233609/http://www.risoe.dk/rispubl/NUK/nukpdf/ris-r-213_p89-104.pdf. Goldblat, Jozef (International Peace Research Institute) (2002). Arms control. Sage. ISBN 0761940162. http://books.google.com/books?id=7Fpvdv4f2cUC. Hanhimäki, Jussi M. & Odd Arne Westad (2004). The Cold War. Oxford University Press. ISBN 0199272808. http://books.google.com/books?id=JSyv24u7iVEC. Heurlin, Bertel & Sten Rynning (2005). Missile defence: international, regional and national implications. Routledge. ISBN 0415361206. http://books.google.com/books?id=_R7Mvo4mGsoC. Jones, W. Glyn (1986). Denmark: A Modern History. Taylor & Francis. ISBN 0709914687. http://books.google.com/books?id=UY4OAAAAQAAJ. Lake, Jon & Mark Styling (2004). B-52 Stratofortress Units in Combat 1955–73. Osprey Publishing. ISBN 1841766070. http://books.google.com/books?id=U0zIt5KPEbQC. Mayall, James & Cornelia Navari (1980). The end of the post-war era. Cambridge University Press. ISBN 0521226988. http://books.google.com/books?id=JQA9AAAAIAAJ. Newtan, Samuel Upton (2007). Nuclear War I and Other Major Nuclear Disasters of the 20th Century. AuthorHouse. ISBN 1425985106. http://books.google.com/books?id=3_2ILEQQqpIC. Ørvik, Nils (1986). Semialignment and Western security. Taylor & Francis. ISBN 0709919514. http://books.google.com/books?id=fJcOAAAAQAAJ&pg=PA205. 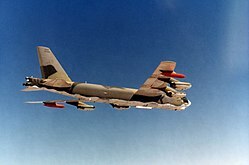 Project Crested Ice: A joint Danish-American report on the crash near Thule Air Base on 21 January 1968 of a B-52 bomber carrying nuclear weapons. Vol 65, Part 2. Danish Atomic Energy Commission. (February 1970). ISBN 8755000061. オリジナルの2011年7月19日時点によるアーカイブ。. https://web.archive.org/web/20110719115903/http://www.risoe.dtu.dk/knowledge_base/publications/reports/ris-r-213.aspx?sc_lang=en. Sagan, Scott Douglas (1995). The Limits of Safety. Princeton University Press. ISBN 0691021015. http://books.google.com/books?id=4pV_wbOnphsC. Schwartz, Stephen I. (1998). Atomic Audit. Brookings Institution Press. ISBN 0815777744. http://books.google.com/books?id=safduT80AHMC. Zukas, Jonas A. & William P. Walters (2002). Explosive Effects and Applications. Springer. ISBN 0387955585. http://books.google.com/books?id=l77rP6LA8TEC. Aarkrog, Asker (January 1970). “Radio-Ecological Investigations”. USAF Nuclear Safety (Danish Atomic Energy Commission). オリジナルの2007年6月9日時点によるアーカイブ。. https://web.archive.org/web/20070609221011/http://www.risoe.dk/rispubl/NUK/nukpdf/ris-r-213_p79-88.pdf 2009年3月16日閲覧。. “Broken Arrow - Palomares, Spain”. USAF Nuclear Safety (Directorate of Nuclear Safety, United States Air Force) Vol. 52. (Sep-Oct 1966). オリジナルの2009年3月27日時点によるアーカイブ。. https://web.archive.org/web/20090327090414/http://www.dod.mil/pubs/foi/reading_room/133.pdf 2009年3月23日閲覧。. “Broken Arrow - Thule”. USAF Nuclear Safety (Directorate of Nuclear Safety, United States Air Force) Vol. 60, Part 1. (Jul-Aug-Sep 1968). オリジナルの2009年3月27日時点によるアーカイブ。. https://web.archive.org/web/20090327090414/http://www.dod.mil/pubs/foi/reading_room/133.pdf 2009年3月23日閲覧。. Dresser, Col D.S. (January 1970). “Host Base Support”. USAF Nuclear Safety (Thule Air Base). オリジナルの2007年6月9日時点によるアーカイブ。. https://web.archive.org/web/20070609220339/http://www.risoe.dk/rispubl/NUK/nukpdf/ris-r-213_p30-46.pdf 2009年4月24日閲覧。. Eriksson, Mats (April 2002) (PDF). On Weapons Plutonium in the Artic Environment. Risø National Laboratory, Roskilde, Denmark: Lund University. オリジナルの2008年12月18日時点によるアーカイブ。. https://web.archive.org/web/20081218233551/http://www.risoe.dk/rispubl/NUK/nukpdf/ris-r-1321.pdf 2008年11月15日閲覧。. Juel, Knud; Gerda Engholm & Hans Storm (デンマーク語) (PDF). Register study of mortality and cancer incidence among Thule workers. National Institute of Public Health (Denmark) & Cancer Society (Denmark). オリジナルの2012年1月31日時点によるアーカイブ。. https://www.webcitation.org/6575ucLZH?url=http://www.si-folkesundhed.dk/upload/thule.pdf 2009年3月30日閲覧。. Juel, Knud (1992). “The Thule Episode Epidemiological Followup After the Crash of a B-52 Bomber in Greenland: Registry Linkage, Mortality, Hospital Admissions”. Journal of Epidemiological and Community Health (Copenhagen: Danish Institute for Clinical Epidemiology). http://www.pubmedcentral.nih.gov/pagerender.fcgi?artid=1059595&pageindex=1 2009年4月12日閲覧。. Kidder, Ray E. (April 1991). “Barrier to Test Ban”. Bulletin of the Atomic Scientists: 22. http://books.google.com/books?id=cwwAAAAAMBAJ. Nielsen, Sven P. & Per Roos (May 2006). Thule-2003 – Investigation of Radioactive Contamination. Roskilde: Radiation Research Deptartment, Risø National Laboratory. ISBN 87-550-3508-6. SAC's Deadly Daily Dozen. Time. (1961-05-17). http://www.time.com/time/magazine/article/0,9171,894429-2,00.html 2009年4月12日閲覧。. “The Worst Nuclear Disasters”. Time. (March 2009). http://www.time.com/time/photogallery/0,29307,1887705_1862266,00.html 2009年3月31日閲覧。. James C. Oskins, Michael H. Maggelet (2008). Broken Arrow - The Declassified History of U.S. Nuclear Weapons Accidents. Lulu. ISBN 1435703618. http://books.google.com/books?id=gi7HARO8vTcC.